Numbers can be deceiving, and one would think that by looking at my results for last Sunday's race I would be disappointed. If you look I placed 49th out of 65 I believe. With this being my fourth season. What that number 49 doesn't convey is that I accomplished my most important set goal ever since I started racing bicycles. 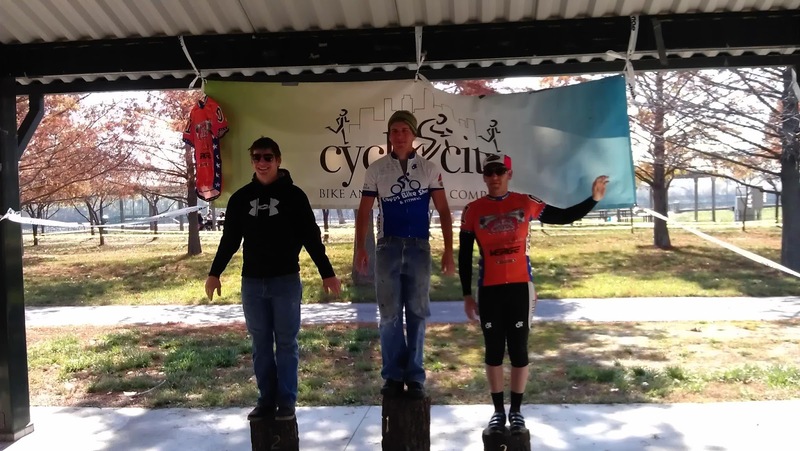 I even managed to podium twice and have a top ten finish in all but one race in my last Cyclo-Cross season. But with all those things out of the way, this one no matter how minimal it may seem for some, eluded me since the beginning. You see, I wanted to become a "roadie", my first bike was a road bike, my first race was a road race, that is all I did. 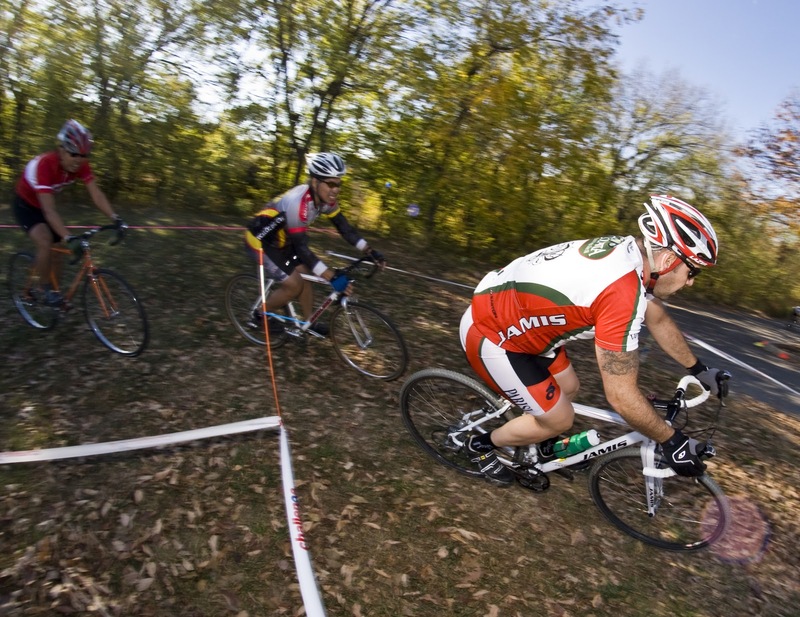 CX was something that I started off doing to keep from sitting on the couch all winter long. I enjoy speeding down the smooth pavement with very little sound other than the wind, like I imagine sailing might feel like. But no matter how much I trained it felt like I was always in over my head, like I bit off more than I could chew. I would line up for a road race and I felt like I had put in the work and inevitably the peleton would drop me. Oh of course I would get really close to finishing with the group sometimes like Sunflower state games a couple of years back when I got dropped only a few miles from the finish line. But no doubt about it I would get dropped. That is what makes this last weekends feat such an important milestone. Just so you know what I am talking about I raced this weekend in a Mens cat 4 crit race and I did not get dropped. Granted I finished in 49th place but if you had been there you would have seen me finish with the group. What is really deceiving is that I probably finished only a few seconds behind the winner. So after participating in a sport that seems to do nothing but keep you humble I gained a ton of confidence. Just so you kow I am celebrating quietly and only after reflecting on the importance of my accomplishment. My mindset has been different since Joules Cross, I looked adversity in the face and laughed that day. I have read and reread my post all through last week and into the weekend trying to analyze what I may have learned of myself from that race. It is like a light has turned on and I now have the confidence to do what I want to do. I showed up to Boss Cross this weekend feeling prepared and hungry for everything that I have been working for these short few years on my bike. Saturday's race could not have gone any better for me. 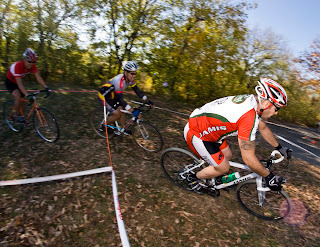 When the whistle blew and for most of the first lap, I was sitting in third place. In the last straight away section of the first lap I had a moment where my butterflies and any nervousness faded and in that split second my brain said "GO FOR FIRST", and so I did. I never looked back either. I lead the rest of the race with a pretty decisive lead. I was all alone out there flying in the wind, setting the pace of the race. When my legs began to hurt and my mind was telling me that it was ok to slow down and or settle for any podium, I would calmly tell it that nothing less then 1st was good enough. Up until this season I have never been anywhere near finishing top ten let alone a podium position. So you have to understand that anywhere up there is uncharted waters for me and a huge improvement from years past. So you can see where I may begin to rationalize and complacency might set in. Sunday was equally a great day for me, I finished 3rd place. You heard it correctly, two podium finishes in one weekend. With those two podiums I have managed to take the points lead in the Boss Cross series. The top photo is of my win on saturday and the bottom is of me in 3rd place and I am wearing the leaders jersey. Only two more races to go in the series, and those take place in three weeks from now. Dropped my chain on the first lap yesterday. As I sat there trying to fix it everyone and their mothers passed me. I was all alone, it was quiet and all I could hear were my thoughts,"why bother now", "I'll just dnf", "I just paid for this race and it is all over". That last thought pissed me off. I got on my bike and started cranking. I eventually caught up to someone and passed him, then another, and another. The single speed guys were out there at the same time as us 4s so I kept looking for derailleurs. I felt great, a lot better than the day before. I kept fighting for positions, and never looking back which is strange for me because I find that all I do is look back and worry about those guys catching me and passing me. I also found myself wishing for extra laps. I never think that way, I usually feel like there are way too many laps left to go. Every time I was about to pass someone that person would surge for a little or they would try and take up most of the lane so I couldn't pass but I would eventually find a spot and pass them, again without looking back. I kept my eyes focused on the next person in front of me, my next target. It was fun being the pursuer, chasing down the next victim. When the race was over I had no idea what position I finished in, but I knew that I had just had one of my best races ever. Why was it one of my best races? Because I actually enjoyed every single second of it, I felt great the entire race, I had plenty of gas in the tank so to speak, and I didn't want it to end. I fought for each and every spot I gained and earned them all. Nothing was given to me and no one took anything away from me either. From the time I got my chain back on not a single rider passed me, so every time I passed someone it stayed that way. Like I often do, they all accepted their destiny. Yesterday I was going to make mine and not just accept it. On the final climb just before the finish I found one more guy that I felt I had enough lap left to catch, and pass. I saw him look back at me when he turned back around I got up and started sprinting for the finish. He took a second look back and saw that I had just gained a ton of ground on him and he began to sprint for the finish as well. I kept my head low and I watched his front wheel compared to mine. He had the inside lane and was closer to the judges. When we both crossed the line I thought it looked like we were even. I figured the judges would give it to him since he was closer to them and from their angle it might have looked like he finished first. Afterwards I walked over to him and thanked him for the fun sprint. I told him that I thought he had beat me and he said that he felt like I had beat him. So now all there is to do is wait for the results to be posted. I went and sat down with the family and recounted my race to whomever would listen. I finished 8th. I was completely surprised. I never would have guessed, I was convinced that I would had finished 12 or 13. I caught and passed 22 riders including that final sprint. I will remember that race for years to come. I just fell deeper in love with cycling. It has been a few months since my last post, and with that post there was a lot of optimism for my cycling season. I managed to get one of the first races in the season in and I had hoped it had been more of a confidence booster. My first Cat4 race was a complete bust for me. Do be fair I did choose a race with one of the toughest climbs of the season so I had two things going against me. After that I started to put in some miles on the bike, but life(as it often does) had different plans for me. I spent an entire month off the bike. My wife and I moved and before we moved in we did some remodle work on the house. All my spare time went to the house so we could keep our move in date deadline. I got back on the bike a week ago and rode a couple of days. Man did I feel it. Not only had I lost some speed, but while I was off summer had come on full blast and the temps have been well over 100 degrees. I was not use to riding in these temps. My head felt like it was a teapot and I needed to release pressure every time I got on the bike and even attempted to keep with with the group. So not only had I slowed down but now everyone had a month of training advantage. I fear my road season has now become nothing more than training for Cross and onto next year. I did try on a race for size this past weekend. State Line Road race was its name and it was the first annual. The course was 6.5 miles long and the mens Cat4 had to do it 7 laps worth. That is a little over 45 miles. I really liked this race. The route was nothing more than a big rectangle with very slight rolling hills until you got to turn three which had a sharp over a 90 degree turn with a sharp climb. Not a major climb but you had to really slow down for the turn so you couldn't carry any momentum into the climb. It felt like a series of stair steps until you got to turn one. 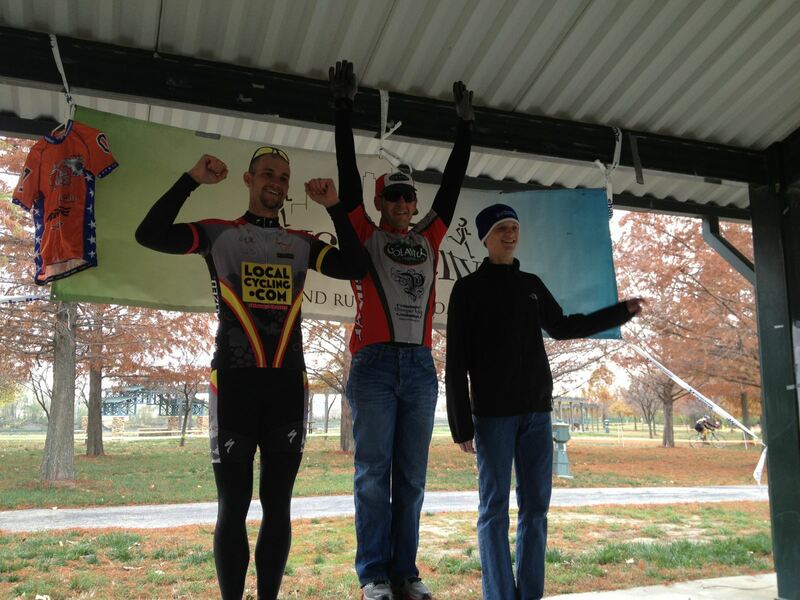 My official placing in the race was 41 out 57 riders. I wasn't completely dissapointed with this cosidering the amount of time I have been out of the saddle. I thought KCOI Boulevard racing team put on a great event. I will absolutely do this race next year, and hopefully place better. Now I think I will try doing one more crit this year maybe 2 out in St.Louis. I see how much I improve between now and labor day. It is a lot of money to spend to go get dropped. The start of any trip begins with that first step. Eventually with persistance and determination you will find yourself no longer within view from that beginning point but also not within view of your final destination. Yesterday I did something that not only had I dreamt of accomplishing but something that I knew would take a lot of hard work, I put in to upgrade to a Cat4 road. I sent in my request yesterday along with my racing resume and recieved my upgrade conformation a couple of hours later. The idea all started when I was at the team party and a fellow teammate Chris Hudson asked me if I was planning on Cat-ing up this season. I gave him some answer which I am sure he saw right through to my true feeling which was doubt that I could even compete as a Cat4 yet. He was polite and accepted my answer, but what he didn't realize is that he had planted a seed, a seed that grew into questions for me. The next morning I went onto USAcycling's site to check to see if I had completed the manditory 10 road races needed to cat up to a four, I counted 8 road races and 18 Cross races. I thought that posting this to my Facebook status update would satisfy my questions/doubts of cat-ing up, until I get a message a few minutes later from Britton a Cat2 and store owner of Volker Bicycles saying that USAcycling would take into consideration all of my resume not just my road races. I flat out asked him if he thought I should cat-up and he said yes. So here I am again with thoughts of should I or shouldn't I cat up. I knew what I had to do, I texted four more people all on my team, all much faster riders than I am and I asked them their well respected opinion too. All came back saying that I should. So now I have my answer yet I am still hesitant to click on the send button. Why am I so hesitant, what am I afraid of, everyone is telling me to do it but I have some reservations. I remember being 5 years old and living in Puerto Rico. My dad at the time worked for Abbott laboratories. Employment with Abbott included many fringe benefits, one being membership to Dorado Beach country club. It had Chi-Chi Rodriguez's signature golf course, tennis courts, club house, and most importantly a olympic size pool where I would learn to swim. I only have a few memories of learning to swim and all of them aren't the most positive. The memories are mostly of my trying to stay afloat with the instructor commanding me to swim to her and she promised not to move. If this story sounds familier to you then you will know that she never stood still and she always backed away forcing me to swim further away from the wall and deeper into the pool. I can still remember the panic I would experience when she would back away. With the more lessons I had the less panic I would feel, and eventually I gained confidence, learned to love to it, and even raced on a swim team in middle school. My cycling journey has come to that point where I have to take my hands off that wall and be willing to swim out to the deeper ends of the pool. I can no longer hide in the kiddie pool. I now have to compete with the big kids in the deeper pools. So a New season is upon us. I know I have neglected my blog for the last couple of months but to be honest nothing much has happened in my cycling world until this passed weekend. Saturday was our team signing party and what a party it was. Free beer, food, and sounds. Colavita/Parisi is growing into one big family, and a happy one at that. We have gained some new faces and some familiar ones and we are going to be an even bigger force to reckon with this year. So I remember at last year's signing party when Adam Keck recieved the award of most improved rider, I had secretly told myself that I wanted to win it for next year. Those are big shoes to fill as Adam is a person to respect both on and off the bike. I trained as much as I could all year with my life being turned upside down with the addition of my daughter Lucy. My wife was and has always been supportive of me, I am a lucky man. Well as you have guessed it, I won it. Having all my hard work recognized by my teammates means a great deal to me. Some are and others have been state champs. I remember my first time going out with them for a Saturday morning ride. I kept up with the group for 4 miles and promptly got dropped. They were only pedaling at an easy pace too. My how things have changed for me. Sunday was our first team ride with all the new guys. It feels funny calling others new and not considering myself a newbie anymore. We had a pretty nice turnout, I think there was 24 people in all. We got into a 2 by 2 line and worked on our pace line for several miles. We also had a "gentlemans race" and it was a blast. We broke up into 5 groups and we raced to an agreed upon destination. This destination was at the top of the second of two long climbs. I am not a strong climber and it is early in the season, but with the confidence of being called the most improved rider I told myself that I was not going to hinder my team in any way. By the time we reached the base of the first climb I was 5th man back and moved up to 4th at the summit. Since the team I was on was all together we took off on our descent on our way to the next climb. We had a large lead on every one else. It was just the four of us at the finish line. I was pumped and surprised at how well I did. The winning team got pizza and coca cola paid for by everyone else. I had already been gone a few hours and wanted to go home and spend some time with Kate and Lucy. I want to take this time to thank everyone who has given me words of encouragement, it makes it a lot easier to stay focused knowing that I am making improvements in my riding. I have found a great bunch of guys that I am proud to call my friends, and teammates. This past weekend was Shawnee Rescue Rad Cross. The mens 4 was at 10am and the mens 3/4 was at 2pm. With so much time between the two I decided to race both. I picked up my new Jamis Nova race on Friday and unfortunately did not have time to ride it before hand. I was a little nervous about this because when racing you have to make many split second decisions at any given time throughout the race. Any mistake or miscalculation and it can cost you your position, your energy, and even your bones if you wreck. I got out there a little early and pre-rode the course and noticed that there was a lot of pavement. So I pumped my tires up to 45 psi each. At no point in the race did my tires feel loose at all. There wasn't much off camber and my tires were hooking up great in the grass. We had a pretty big group, 35 in all. I didn't expect much from myself since there was two sand pits back to back with maybe 35-40 feet of grass between. Almost enough to ride and just a little too long to run. I decided to run it all but when on grass I would roll the bike instead of shouldering it. This proved to be my most hated section of the race because right after that there was no time to recover, you went right in to a gradual climb. No rest for the weary. I managed to finish 18th. The guy in front of me had a pretty good lead for the last two laps and when coming to the finish line I noticed that he let up his pace, he let up his pace a lot. I was a good 200-250ft behind him and I decided to sprint for it. I know that sprinting for 18th is not glorious but I made the decision to go for it. 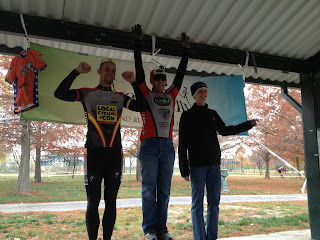 I beat him to the line and did the dorkiest hand in the air gesture like I had just won the whole thing. I immediately felt stupid for doing the gesture but I was happy that I sprinted. More about that feeling in a minute. After the race I ate, drank, and rested. I even had time to go pick up Kate and Lucy. They dropped me back off and they went on to the mall like I suspect they will be doing for many times to come. I have never done a 3/4 race and didn't expect much from myself for a couple of reasons, 1) I raced earlier in the day and 2) I would be racing against 3s. The race time went from 30 minutes in the 4s to 45 minutes in the 3/4s. At one point in the race I almost pulled myself, I was so tired I was basically just walking it. My energy level dropped after lap number 3 of 8. My last two laps I was using as a cool down I was going so slow. I am glad I did it as it helped to push me out of my comfort zone. The course judges placed me at 25 out of 27 but it was an error on their part. I actually finished 24 out of 27. My fellow team-mate S.C. won the race. He managed to lap me once and I was happy he did. It cut my laps down from 8 to 7 total. He looked great out there, really strong and comfortable. That was his day and he took it. Good for him, he has been working hard for that for a long time. With all that being said, on my Monday night ride I had a word pop into my head, that word is "heart". I have not been able to shake that word since I first thought it. I have been thinking about what it means to me, do I have it, if not how do I get it? I remember watching Rocky 2 and Rocky is challenged by Clubber Lang, and Clubber Lang says Rocky isn't a real champion. Apollo Creed is training Rocky and tells him that he needs to get the "Eye of the Tiger". You know that desire to win, that hunger and need to beat any opponent. I know that I haven't been racing with that emotion. My motivation has been to do better than I have ever done before. Tri-atheletes call this a "p.r." or a "personal record". I wonder if I will ever get that real desire to win or if I will just keep going along trying to beat my P.R.? Do I even need that desire to win at all cost? Will it make my training more effecient? Lots of questions in my head right now. I do know that I love cycling and I love all the things I have accomplished including all the psychological things I have over come. One being the fear of competing in front of people knowing that I may be judged. It is funny all the things that we can carry in life not knowing, things that may seem insignificant to others but to some it means avoiding certain situations in life. I only wish I had conquered that one earlier in life. 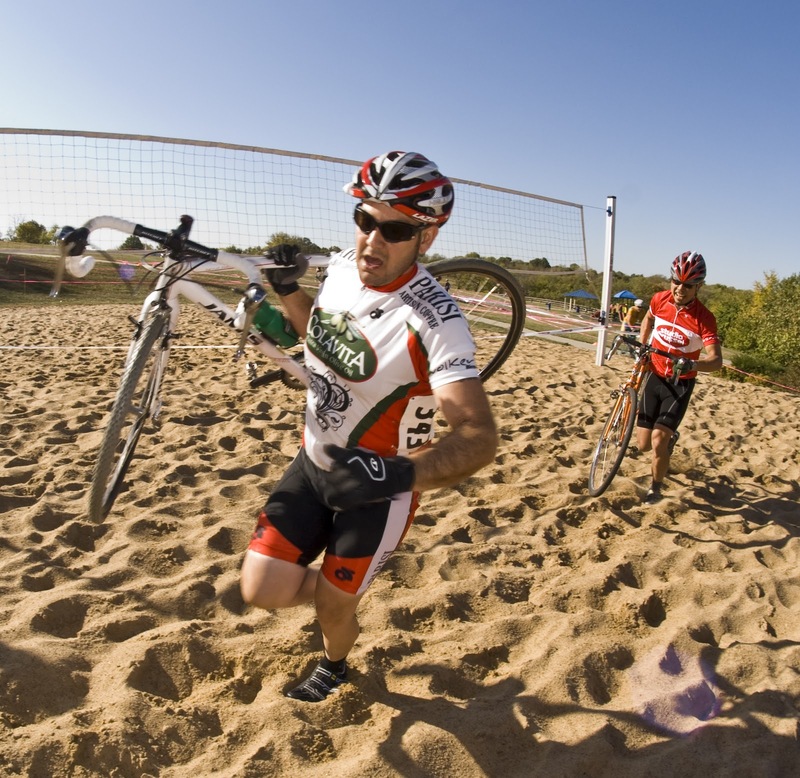 Cycling has given me the medium to over come many of my lifes obstacles. For that I love it even more. These pics are from Jon Peck and they are my faves so far. 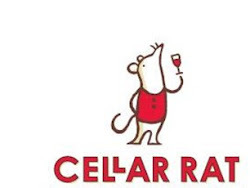 Cellar Rat is more than a wine store. located in the Crossroads area of K.C. and a great sponsor. I was raised in South Florida and in late 2007 my wife and I decided to move to Kansas City where she is originally from. We moved to mid town and I was enamored by the cycling community. This blog is to chronicle my love with cycling and my improvements in racing from a complete newbie. I was embraced by a local cycling team called Colavita/Parisi of Kansas City and have enjoyed everyday I have been on the team. I feel like a kid again.